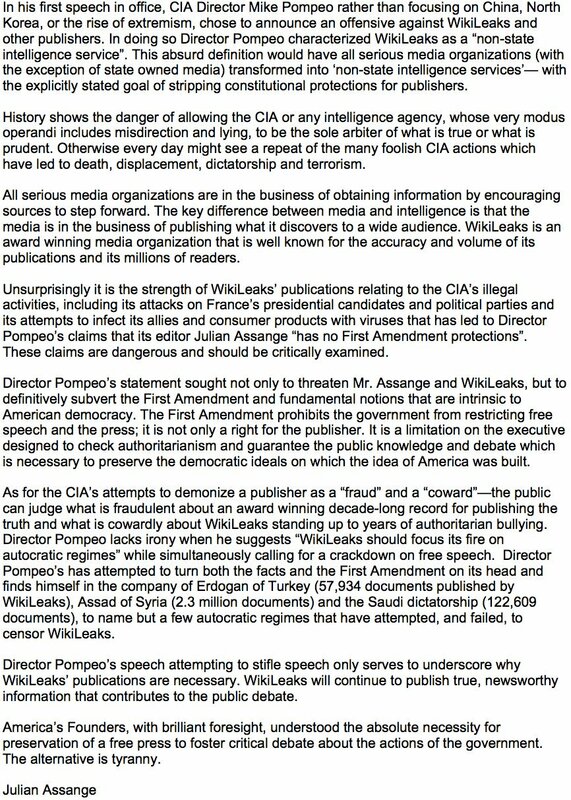 Early in his tenure as CIA Director, Pompeo gave a speech in which he famously said that “WikiLeaks walks like a hostile intelligence service and talks like a hostile intelligence service,” and in fact is “a non-state hostile intelligence service.” The resulting response was varied and intense. Many of WikiLeaks’ detractors, especially Democrats, seized on the characterization. Commentary from others argued that whether or not one supported WikiLeaks, the description should not be embraced as it was a threat to free speech. For their part, WikiLeaks alternated between outrage and amused mocking. 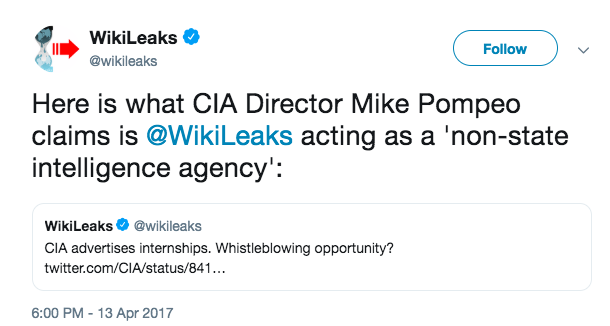 In one of their earliest tweets on the matter, they somewhat dismissively referred to Pompeo’s description of WikiLeaks recruiting people. The following day, WikiLeaks released a statement in Assange’s name calling the accusation part of an “offensive against WikiLeaks.” The statement goes on to call it an “absurd” phrase that could be applied to all journalistic outfits. The statement is followed by a link to an article. Clicking on it, however, shows that WikiLeaks is being disingenuous. The government’s statement was that Chelsea Manning was aware that Julian Assange and WikiLeaks considered themselves to be a non-state intelligence service. While the government hardly disagreed with the characterization of WikiLeaks as an intelligence service, the organization’s willingness to misrepresent the statement to have the description applied to them highlights how strongly they felt about it. Julian responded in agreement, stating that the original WikiLeaks about page said that it was “the first intelligence agency of the people.” He then went on to quote the original page. At no point does WikiLeaks appear to have abandoned the description. As of today, WikiLeaks continues to not only promote it on one of their websites, they use it for fundraising. 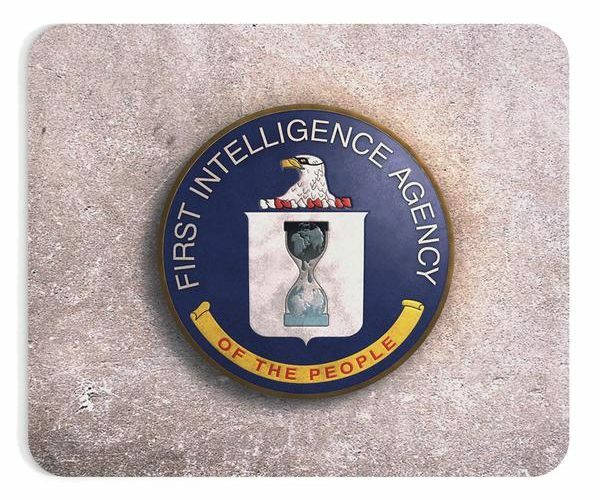 As of this writing, you can buy an “intelligence agency of the people” mousepad, mug, laptop sleeve, tote bag, or three different phone cases and styluses. 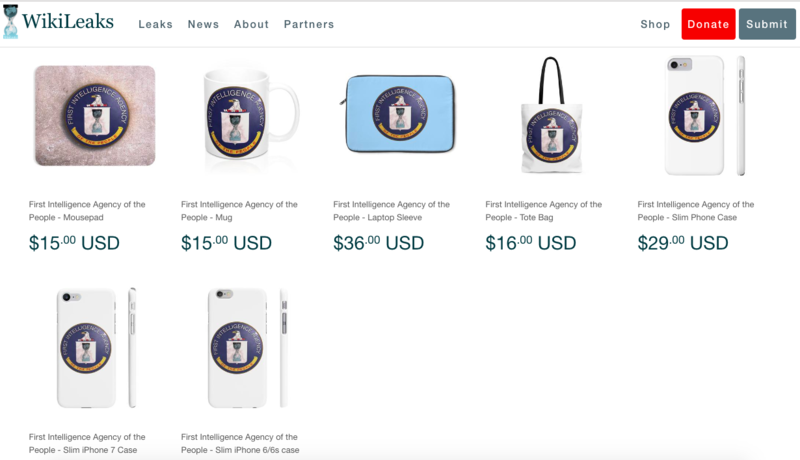 Buying every piece of official WikiLeaks “intelligence agency” swag would cost just under $150. 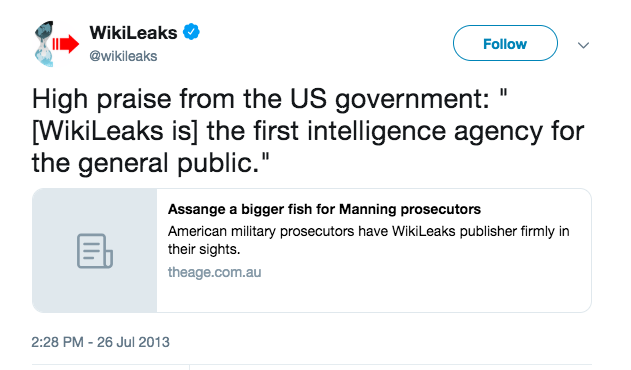 While WikiLeaks and others decried the government’s characterization of WikiLeaks as an intelligence service as a standard that could be used to all media organizations, this overlooks the simple fact that it was WikiLeaks themselves that first made this characterization – and continue to do so. If organizations like the New York Times or The Intercept want to avoid being labeled as a non-state intelligence service, they likely have only one thing to do – simply don’t brand themselves that way and especially don’t use that branding to raise money. There's nothing wrong with a group considering themselves this. In a way, it really is a noble sentiment. But you can't have it both ways, and you don't get to cry foul when your opposition agrees with you. Why is WikiLeaks’ “entire raw dataset” of Podesta emails incomplete, and exactly how many are there?